Post from September 8, 2016 (↻ June 12, 2017), filed under Philosophy. 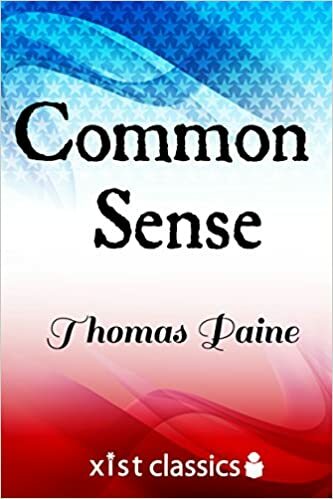 The second part of a new series, here are some highlights from Thomas Paine’s Common Sense (1776). Who the Author of this Production is, is wholly unnecessary to the Public, as the Object for Attention is the doctrine itself, not the man. Society in every state is a blessing, but government even in its best state is but a necessary evil […]. A thousand motives will excite them thereto, the strength of one man is so unequal to his wants, and his mind so unfitted for perpetual solitude, that he is soon obliged to seek assistance and relief of another, who in his turn requires the same. If the colony continues increasing, it will become necessary to augment the number of the representatives, and that the interest of every part of the colony may be attended to, it will be found best to divide the whole into convenient parts, each part sending its proper number; and that the elected might never form to themselves an interest separate from the electors, prudence will point out the propriety of having elections often; because as the elected might by that means return and mix again with the general body of the electors in a few months, their fidelity to the public will be secured […]. […] as this frequent interchange will establish a common interest with every part of the community, they will mutually and naturally support each other, and on this (not on the unmeaning name of king) depends the strength of government, and the happiness of the governed. Here then is the origin and rise of government […]. Absolute governments (tho’ the disgrace of human nature) have this advantage with them, that they are simple; if the people suffer, they know the head from which their suffering springs, know likewise the remedy, and are not bewildered by a variety of causes and cures. There is something exceedingly ridiculous in the composition of monarchy; it first excludes a man from the means of information, yet empowers him to act in cases where the highest judgment is required. The state of a king shuts him from the world, yet the business of a king requires him to know it thoroughly […]. […] the will of the king is as much the law of the land in Britain as in France, with this difference, that instead of proceeding directly from his mouth, it is handed to the people under the more formidable shape of an act of parliament. […] as a man, who is attached to a prostitute, is unfitted to choose or judge a wife, so any prepossession in favour of a rotten constitution of government will disable us from discerning a good one. Oppression is often the consequence, but seldom or never the means of riches […]. In the early ages of the world, according to the scripture chronology, there were no kings; the consequence of which was, there were no wars; it is the pride of kings which throw mankind into confusion. For all men being originally equals, no one by birth could have a right to set up his own family in perpetual preference to all others for ever, and though himself might deserve some decent degree of honours of his contemporaries, yet his descendants might be far too unworthy to inherit them. […] what at first was submitted to as a convenience, was afterwards claimed as a right. England, since the conquest, hath known some few good monarchs, but groaned beneath a much larger number of bad ones […]. If the first king of any country was by election, that likewise establishes a precedent for the next; for to say, that the right of all future generations is taken away, by the act of the first electors, in their choice not only of a king, but of a family of kings for ever, hath no parallel in or out of scripture but the doctrine of original sin, which supposes the free will of all men lost in Adam; and from such comparison, and it will admit of no other, hereditary succession can derive no glory. In short, monarchy and succession have laid […] but the world in blood and ashes. In England a king hath little more to do than to make war and give away places; which in plain terms, is to impoverish the nation and set it together by the ears. Europe is too thickly planted with kingdoms to be long at peace, and whenever a war breaks out between England and any foreign power, the trade of America goes to ruin, because of her connection with England. […] if they cannot conquer us, they cannot govern us. Small islands not capable of protecting themselves, are the proper objects for kingdoms to take under their care; but there is something very absurd, in supposing a continent to be perpetually governed by an island. […] a government which cannot preserve the peace, is no government at all, and in that case we pay our money for nothing; and pray what is it that Britain can do, whose power will be wholly on paper, should a civil tumult break out the very day after reconciliation! It is not in numbers, but in unity, that our great strength lies […]. No nation ought to be without a debt. A national debt is a national bond […]. Britain is oppressed with a debt of upwards of one hundred and forty millions sterling, for which she pays upwards of four millions interest. […] our methods of defense ought to improve with our increase of property. […] although Britain, by her fleet, hath a check over our trade to Europe, we have as large a one over her trade to the West Indies, which, by laying in the neighbourhood of the continent, is entirely at its mercy. […] nothing but Continental authority can regulate Continental matters. It is a matter worthy of observation, that the more a country is peopled, the smaller their armies are. Immediate necessity makes many things convenient, which if continued would grow into oppressions. Expedience and right are different things. […] until an independance is declared, the Continent will feel itself like a man who continues putting off some unpleasant business from day to day, yet knows it must be done, hates to set about it, wishes it over, and is continually haunted with the thoughts of its necessity. In short, Independance is the only bond that can tye and keep us together. We shall then see our object, and our ears will be legally shut against the schemes of an intriguing, as well, as a cruel enemy. The mercantile and reasonable part in England, will be still with us; because, peace with trade, is preferable to war without it. When men have departed from the right way, it is no wonder that they stumble and fall. Our plan is peace for ever. Read the whole book: Common Sense .